Posted on January 23, 2013 by Susan H.
I love a freshly baked muffin for breakfast with my cup of green tea…crunchy on the top, moist and warm in the middle. My idea of a perfect any day morning breakfast! While perusing through the recipes in my Canadian Living Step By Step Cookbook, a muffin recipe caught my attention…Honey Oat Muffins. Click here for the original recipe by Canadian Living. I was curious to taste the difference between honey vs. sugar in a muffin. Egg replacement: 1/2 tsp of baking soda and 2 tbsp of water (add baking soda to the dry ingredients and water to the wet ingredients). Buttermilk replacement: Equal amount of Natur-a Soy or Natur-a Rice Beverage mixed with 1 1/2 tbsp of vinegar (let sit for 5 minutes to thicken). Increased fibre content: Equal amount of whole wheat flour instead of unbleached all-purpose flour. When I crave freshly baked muffins for breakfast…I make sure I do all my prepping the night before. 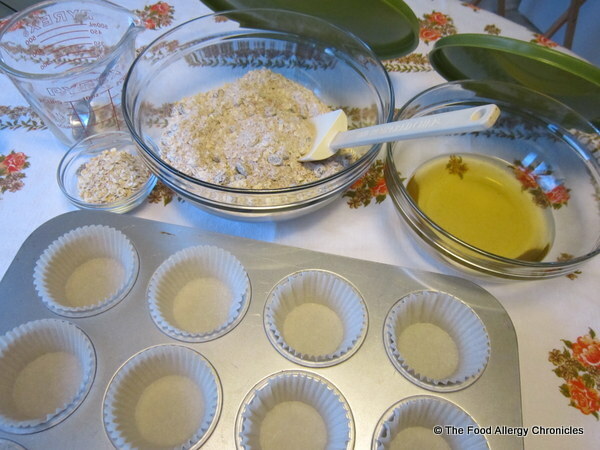 I measured and mixed together all my dry ingredients, all my wet ingredients and placed the paper muffin cups in the muffin tin ready to fill. I only prepped those ingredients that did not need refrigeration, therefore, the liquid measure with the tablespoon was empty. I waited until the morning to prepare my ‘buttermilk’ replacement. Come the next morning…all that needed doing was turning the oven on and preparing my ‘buttermilk’ replacement. When the oven reached the desired temperature, I added the ‘buttermilk’ replacement to the wet ingredients, then added the wet to the dry and mixed until just combined. and my muffins to cool for 10 minutes. I baked two batches of this recipe…one with the baking soda/water egg replacement (measurements given above) and the other with a flaxmeal egg replacement (see below). Both recipes were prepped the night before. For the flaxmeal egg replacement recipe: mix 1 tbsp flaxmeal with 3 tbsp water, stir to combine and then refrigerate overnight. Follow the original recipe, adding the flaxmeal mixture when the egg is called for in the recipe. 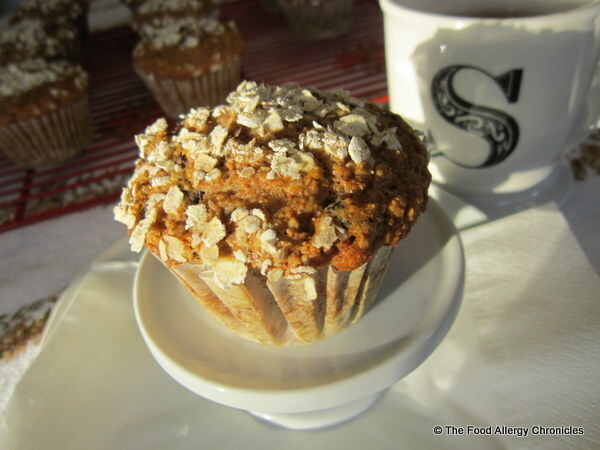 I was pleasantly surprised how the flavour of the honey permeated the muffins… I really enjoyed the change in sweetness. With all that fibre content…they were delightfully light! Tip 1: For the second batch with the flaxmeal egg replacement…I also increased the cinnamon to 2 tsp and sprinkled whole oats rather than the quick oats on the tops of the muffins prior to baking. I must say, they were equally delicious. Nutrition wise, I think I would use the flaxmeal egg in future. Tip 2: Prepping the muffin ingredients the night before works really well when you have overnight guests…with a fresh fruit salad or some fresh fruit…your guests will think they are staying at a B & B! P.S. 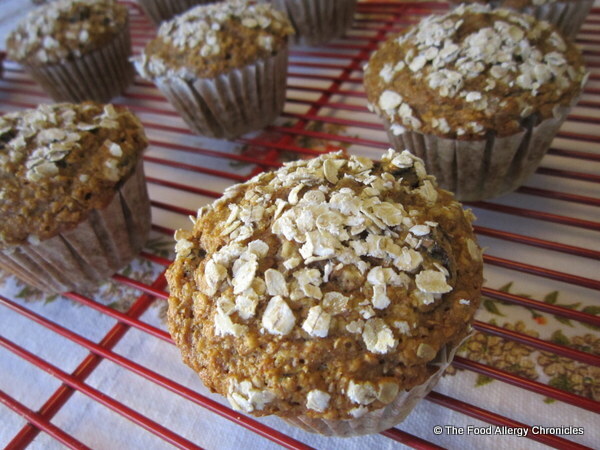 I dropped a couple of my Dairy, Egg, Soy and Peanut/Tree Nut Free Honey Oatmeal Muffins at Michael Penney’s yesterday. Click here for his post on my dropping by. A little something to say thank you for letting my husband and I borrow a blanket to keep my new antique desk, I had just purchased, from getting bumped en route to it’s new home. Plus, I wanted to show him how beautifully his antique desk fit into my home. Would you prep the night before for that freshly baked muffin experience first thing in the morning? 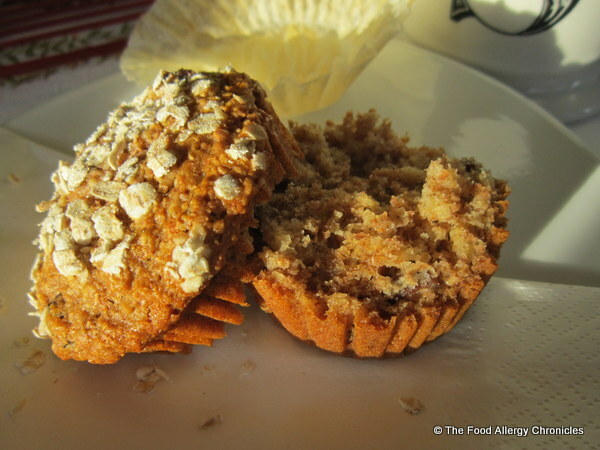 This entry was posted in allergies, baking, dairy free, egg free, muffins, multiple food allergies, oats, peanut/tree nut free, sesame free, soy free and tagged Canadian Living Step By Step Cookbook, Dairy Egg Soy and Peanut/Tree Nut Free Honey Oat Muffins, Michael Penney Style, Natur-a Rice Beverage, Natur-a Soy Beverage by Susan H.. Bookmark the permalink. The desk looks terrific! I love it. As for the prepping, I often do this for waffles. I mix all the dry. Prep the waffle maker and have all the wet measured out and ready to combine when the waffle maker is hot and ready. I will make these over the week-end! The bagel will be next. 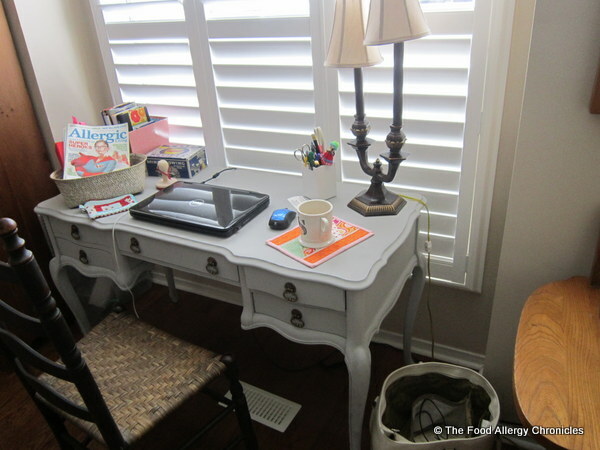 My daughter has food allergies as well….so I am always happy to find new recipes! Found you blog from Micheal Penney’s blog. I always used to prep the night before too, but then one time I got a little carried away and realized I had the batter and it was still night time! I left it in the fridge over night and found that my muffins turned out even lighter and fluffier as they had some time to rise, and the oats has time to soften (I made banana oat muffins)!